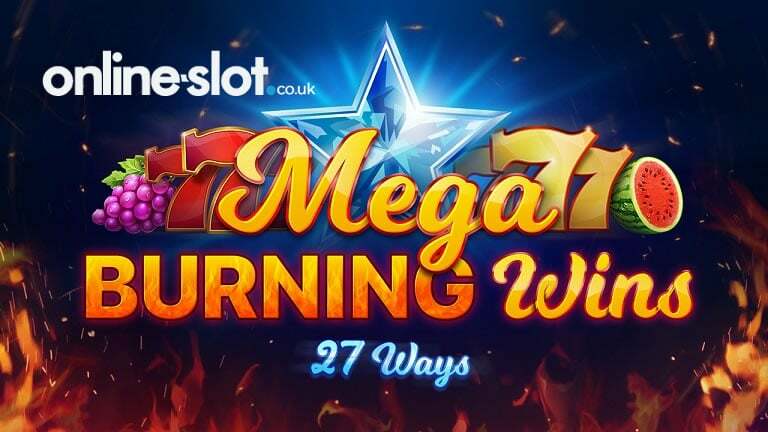 Part of Playson’s series of classic fruit machine releases is Mega Burning Wins: 27 Ways. This one is a little different from many of the developer’s other releases in that it uses a win all ways game engine rather than paylines. The only other extra is a Bonus Wheel feature which awards instant win prizes of between 30 and 100 times your total stake. Play this medium volatility game on your computer, tablet or mobile device from between 10p and £100 per spin. There’s a glossy look to the visuals in Mega Burning Wins: 27 Ways. On the deep blue reels you’ll see a selection of classic fruit machine symbols. At the bottom of the payout food chain are the plums, cherries and oranges. Land 3 of these on adjacent reels and you’ll pocket an award of double your total stake. The grapes and melon follow, awarding 4 times your stake for a 3-symbol combination. More rewarding still are the bells and bars which pay 10 times your stake. Offering payouts of 30 times your stake, the red and gold 777 symbols are the most lucrative. There’s also a wild. This too pays 30 times your stake as well as substituting for all of the standard symbols. There is one feature in Mega Burning Ways: 27 Ways. Bonus Wheel feature – you can trigger this spin the wheel feature by landing any of the following 3 scatter / wild combinations on the same spin. The Bonus Wheel feature then stirs into life. On offer here are instant win payouts of 30, 40, 50, 60 or 100 times your total stake. Which one you receive depends on where the pointer lands. That’s your lot as far as gameplay goes in this medium volatility game. The lack of free spins or other extras means it might be a little vanilla for some tastes. If you want variety and extras, then give this a swerve. If you fancy playing a classic fruity with a twist thrown in, then that’s what you’ll find in Mega Burning Wins: 27 Ways. I would much rather play their other slots like Vikings Fortune: Hold and Win or Mighty Africa: 4096 Ways which offer more in terms of features and maximum payouts.